1. Heat the oil in a large saucepan over a medium heat. Add the onion, fennel, carrots and thyme, season and soften for 5 minutes. Turn up the heat and stir in the chopped tomatoes. Cook for 4 minutes until the tomatoes just start to break up at the edges. 2. Tip in the beans, stock and 100ml water and bring to the boil. 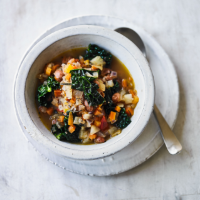 Cover and simmer for 5 minutes then add the cavolo nero and simmer for a further 10 minutes or until the vegetables and beans are very soft. Season to taste. Finish with a squeeze of lemon juice to taste and ladle into bowls to serve. Cook’s tip You could add some Cooks’ Ingredients Pulled Ham Hock for any meat lovers. Stir in at the end of stage 2 and warm through. 3 of your 5 a day; high in fibre.